The Senate Ethics Committee "severely admonished" Sen. Robert Menendez (D., N.J.) on Thursday and ordered him to repay unreported gifts. In the committee's public letter of admonition addressed to Menendez, the senator was ordered to pay back the gifts he received from Florida eye doctor Salomon Melgen, who was also a donor to Menendez's campaign, the Washington Post reports. 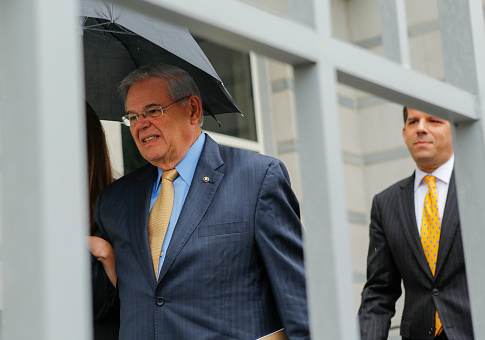 Menendez faced scrutiny for his dealings with Melgen, in which Menendez was accused of engaging in activities that benefited Melgen financially. It resulted in a mistrial followed by a judge clearing Menendez. "Your assistance to Dr. Melgen under these circumstances demonstrated poor judgment, and it risked undermining the public’s confidence in the Senate," the letter says. "As such, your actions reflected discredit upon the Senate." The letter was signed by the six senators who sit on the Ethics Committee, three Republicans and three Democrats. Part of what got Menendez in trouble was his failure to properly report the gifts on disclosure forms. The investigation into Menendez by the Ethics Committee was halted for several years while the Department of Justice was investigating and prosecuting Menendez. Censure or expulsion are additional options the Ethics Committee could use to take action against a sitting senator. This entry was posted in Politics and tagged Ethics, Robert Menendez, Senate. Bookmark the permalink.